From fedora hats to Chelsea boots, suede moto jackets, and slip dresses, the Detroit boutique is known for on-trend bohemian pieces. 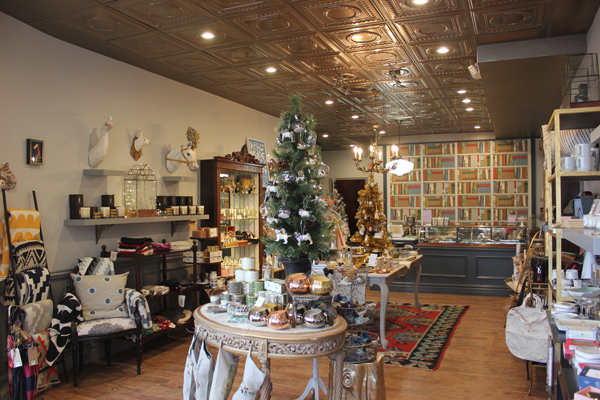 This season, Bird Bee has opened a popup on Woodward Avenue that carries a selection of giftable items, such as chenille hat and scarf sets, Cleobella handbags and wallets, and locally made jewelry. The Woodward store, running through January as an extension of the boutique’s Griswold Street location, will offer women the opportunity to fill out wish lists, which their significant others, friends, or family can pick up to guide their shopping. 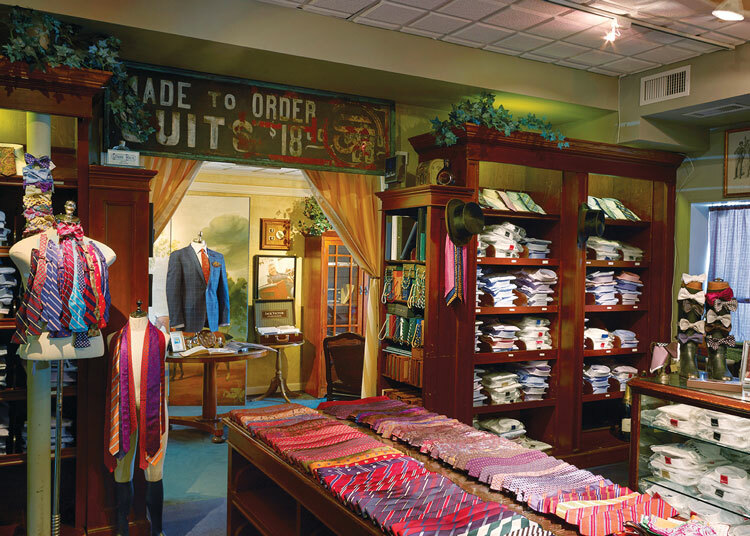 Founded in the mid-’60s, this Birmingham-based boutique offers a classic selection of men’s suiting, neckwear, dress shoes, and outwear. This holiday season, Claymore Shop will be offering complimentary gift wrapping, coffee, and cookies. Members of the Claymore Shop e-Club, a newsletter about the store’s events, sales, and collections, will also receive a $50 holiday gift card. JJ Benkert, president of the store, says some of its most popular gifts include a hand-stained Italian leather euro wallet, Harley of Scotland wool sweaters, and a suede shearling field coat with horn buttons. Several generations of well-dressed locals have come to rely on this boutique’s personal service and unique, yet classic styles. 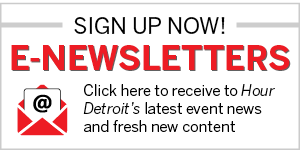 Détroit Is the New Black’s flagship store has only occupied its 6,000-square-foot Woodward Avenue space since 2016, but the clothing brand and boutique has gained a large following. Opened by Seattle-native Roslyn Karamoko, who moved to the city in 2013, the shop carries its own branded merchandise as well as items from Douglas & Co., The Lip Bar, Detroit Rose, Tracy Reese, Anna Sui, and more. Stop by to enjoy popups from local companies Alchemy Henna and Coffeehaus Detroit. Coffeehaus will be serving drinks throughout the holidays. Named after the owner’s father and two brothers, George Gregory is one of the more recent men’s fashion boutiques to set up shop in Detroit. The store, which carries sizes small to XXXL, is set in a bistro-style space with tables and chairs that line its 6-foot windows. Customers can enjoy coffee, hot chocolate, beer, or wine while browsing a selection of items from brands like Civil Society, Yellow 108, and Bridge & Burn. A TV also broadcasts major sporting events, which means you never have to miss the game. The ambiance at this Birmingham boutique sets out to surprise and delight. 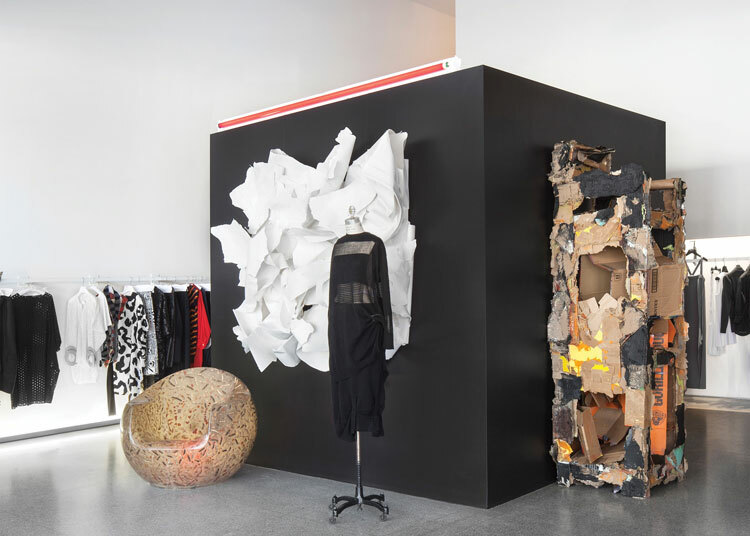 Art installations are coupled with a selection of clothes and accessories. Orleans + Winder is an Eastern Market boutique that specializes in slow fashion, a movement focusing on ethical and sustainable practices in clothing creation and consumption. Throughout the month of December, the store will host a variety of designer trunk shows, giving gift-givers the opportunity to pursue items from a variety of brands. Shoppers will also receive a $50 gift card with every purchase of more than $200, and they can expect to see items in store from designers like Uma Wang, Forme d’Expression, Shaina Mote, and Marc le Bihan. Some of Smplfd’s more standout pieces include its vintage-looking Detroit Bad Boys apparel, “dad caps,” and triangle tote bag. Vincent Troia, creative director of the brand, says customers will often buy the same T-shirt or sweatshirt for several of their friends or family members around the holidays. Given the popularity of their items, the clothing and printing company plans to release new designs and products as well as more styles and new color options for its existing designs. Troia also says customers can expect price discounts, special deals, and gift cards. Check out their sewing and printing services, which include hemming and screen printing customers’ designs on clothing. Tender shines when it comes to its selection of pieces from international designers, such as Marni, Simone Rocha, and Peter Pilotto. Along with its usual offering of high-end women’s clothing and accessories, the Birmingham boutique is hosting a trunk show from Nov. 30-Dec. 2 that features vintage pieces curated by jewelry collector Carole Tanenbaum. Vice President of Tender, Cheryl Daskas, says that one-of-a-kind pieces, like those customers can expect to see at the trunk show and in Tender’s daily assortment of products, make the perfect holiday gifts. WHILE INDEPENDENT STORES TEND to offer the most unique shopping experience, sometimes you just can’t resist a trip to the mall. 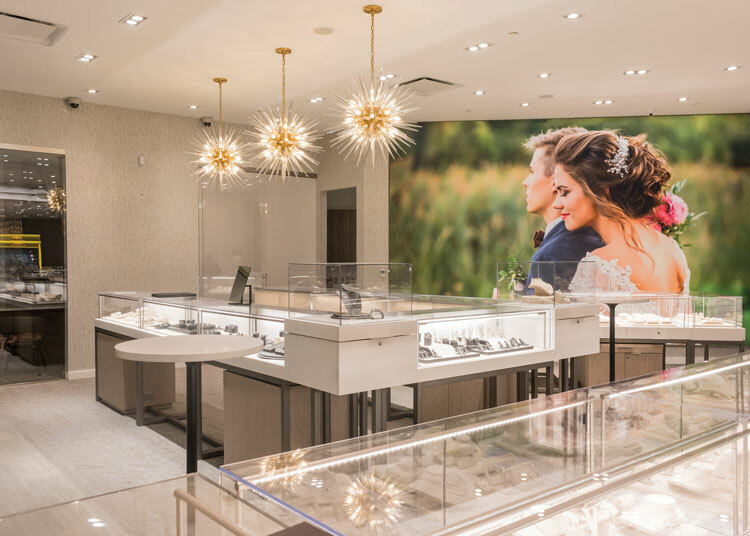 Along with luxury jewelry, Tapper’s new store at Somerset Collection features a tap room that serves draft beer, draft root beer, soft drinks, and water. Zara, which offers trendy clothing for men, women, and children, is another newcomer to Somerset worth a visit. Finally, if you find yourself in Novi, check out Twelve Oaks Mall stores Merit and York Project, which design and sell products that help high school students and those experiencing homelessness, respectively. Blossoms carries fragrances, candles, and diffusers, but what the shop is best known for are its beautiful floral arrangements. The company’s Midtown and Birmingham shops gather flowers, foliage, and botanicals from all over the world to make their creations. “We use very special varieties and colors of flowers,” says owner Norman Silk. For a gift that keeps on giving, shoppers can sign a friend, family member, or co-worker up for Blossoms’ subscription service. The shop offers three-, six-, and 12-month plans for the program, which sends arrangements to those who are registered. 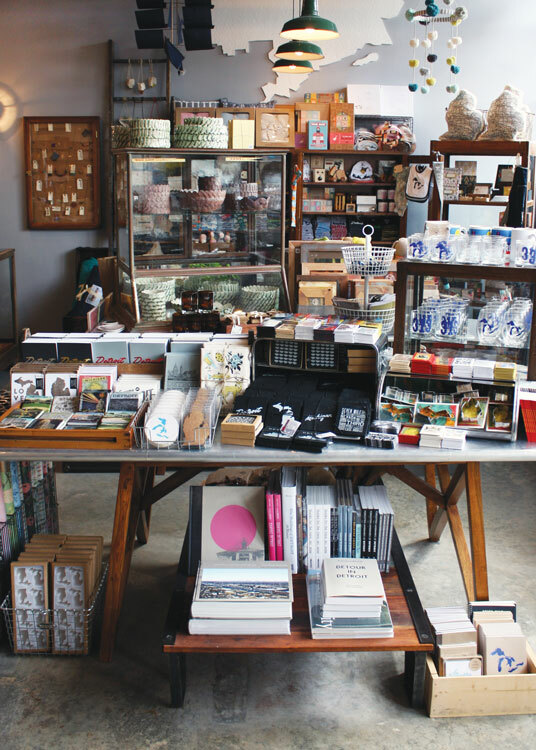 The Midtown-based store carries the largest selection of products from Rifle Paper Co. as well as a carefully curated assortment of local art, design, and handmade goods. 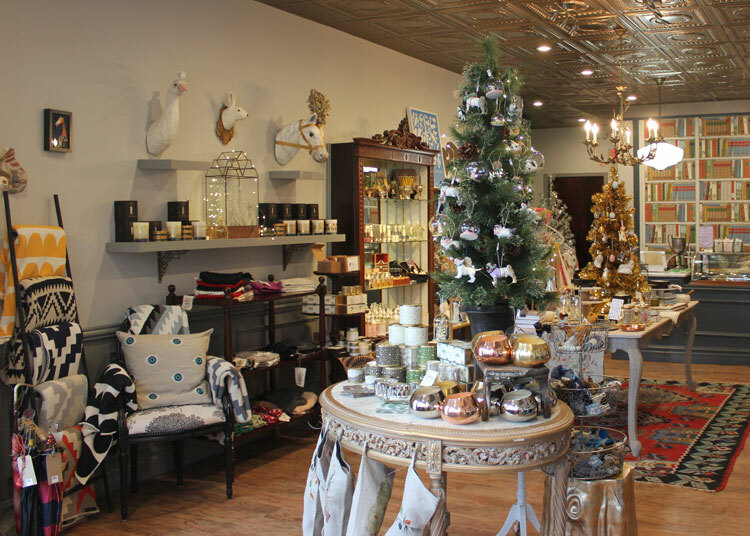 Stop by City Bird on Dec. 2 for a Noel Night party and to pick up items created by Michigan-based companies like Rebel Nell jewelry, Simply Curated candles, and Smplfd hats. 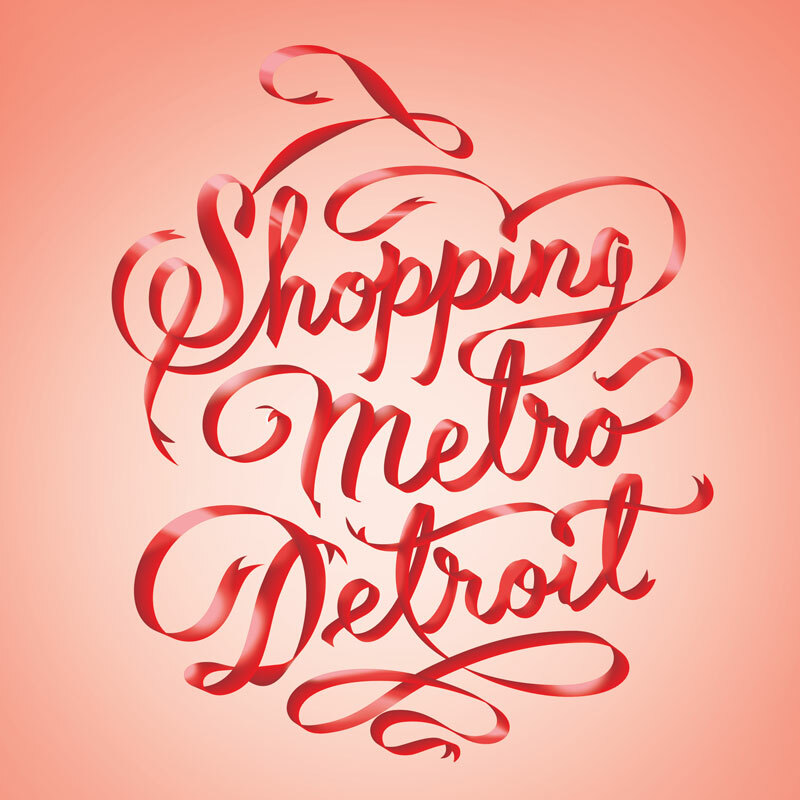 The shop also stocks designs produced by its own studio team, such as throwback Tigers apparel, accessories featuring a vintage map of Detroit, magnets with illustrations of Detroit landmarks, and more. Although they distribute to some 200 other Michigan stores, the flagship store on Canfield is always the first location to debut new designs and in-store exclusives. 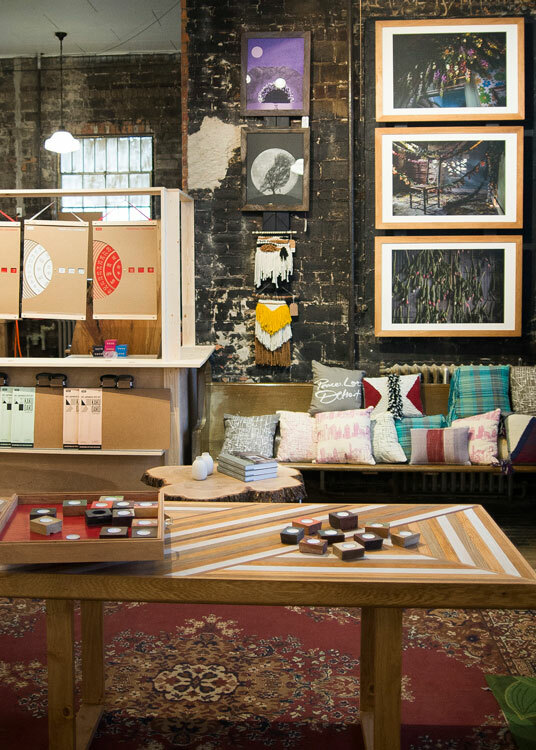 Housed in two vintage buildings, the 23,000-square-foot space occupied by Leon and Lulu features items created by local and international brands and artists. “Our buyers have spent months shopping all around the world for a fabulous assortment of great fashion, home accents, and gifts,” says owner Mary Liz Curtin. As a bonus, the store also offers complimentary gift wrapping and there’s always plenty of free parking. For those hoping to literally not shop until they drop, refuel at Leon and Lulu’s restaurant called Three Cats Café, which serves pastries, coffee, wine, and more. Shoppers can expect to find gifting items like oversized art books, niche fragrances from small-batch perfumers, and home and bar accessories this month at Scout. Owner of the Royal Oak-based shop, Pam McLenon, says they love vintage and usually save its best items for December. “We’ve got you covered down to tastefully simple hostess gifts or even something special for that second cousin’s new fiancée,” she says. Throughout the season, customers will also be treated to occasional snacks and champagne while shopping. There will also be holiday-themed music and gift-wrapping services. The store carries small run gifts and decor from around the world — and even some things they make themselves. Every year, Thistle & Bess creates intricate holiday windows and shop displays all centered around a store-wide theme. To get shoppers in the holiday spirit, this year’s theme is the Royal Tenenbaums, the dysfunctional family at the center of a 2001 Wes Anderson film. On Dec. 1, the shop will be participating in Ann Arbor’s Midnight Madness/ Kindlefest Event. Thistle & Bess will be open until midnight, and will offer cocktails and the chance for customers to participate in a discount raffle to receive 15-50 percent off a purchase. The Ann Arbor shop features curated gift options that are crafted by small, independent artists and makers from local community and abroad. The name says it all: Devries & Co. 1887 has been an Eastern Market mainstay for its vast collection of specialty foods since the late 1800s. 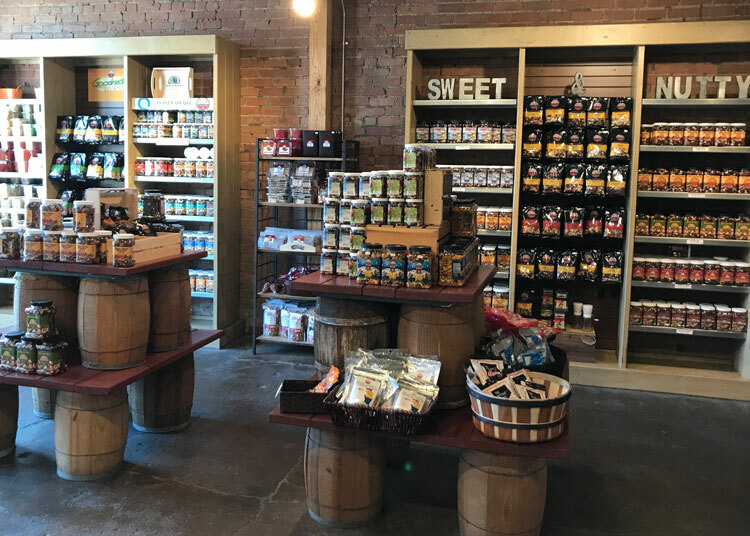 The quaint, family-owned shop has amassed a loyal clientele in the metro Detroit area for its variety of gourmet cheese, butter, and fresh eggs, and its position in the heart of Eastern Market draws an equally large crowd of international shoppers, as well. For the holidays, Devries ups its selection of imported delectables and specializes in creating bespoke gift packages. Allow the staff to create made-to-order baskets stocked with Michigan-made snacks or purchase a fine cheese platter for the next cocktail party. Brothers John and Frank Germack Sr. founded Germack Pistachio Co. to provide pistachios and Mediterranean delicacies to Detroit’s Eastern European immigrant population in 1924. The salty snack quickly became a widespread must-have. Today, Germack offers a range of locally roasted nuts, candy, dried fruit, and more. (The brand even provides peanuts for all Tigers, Red Wings, Pistons, and Lions home games!) Visit during holiday season to gift a loved one a bag of mixed snacks. Or, pop in for a cup of coffee at Germack’s new full-service espresso bar. The jolt of caffeine may come in handy to help you finish your holiday shopping. Fun fact: Germack pistachios are roasted in vintage coffee roasting machines. As a nod to this fact, the company now roasts coffee on site, as well. Located in the center of downtown Detroit, wine shop House of Pure Vin’s staff will be dishing out tips, tastings, and champagne and sparkling wine suggestion for holiday celebrations throughout the month of December. 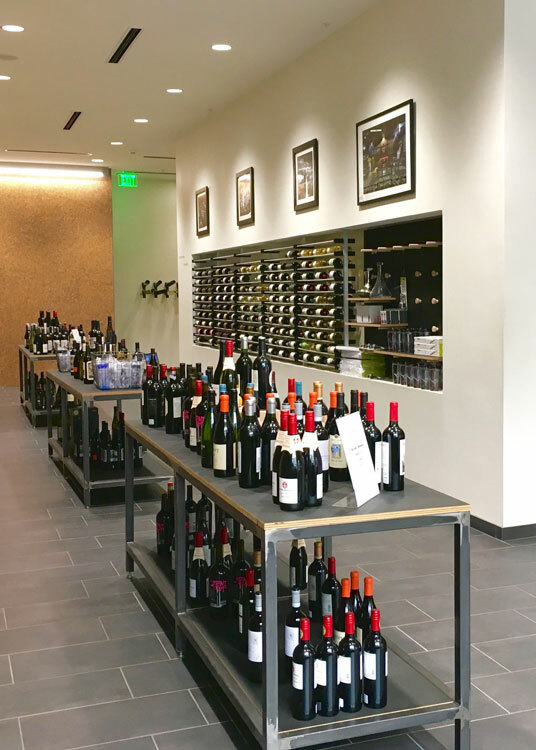 The wine shop also plans to double the number of its special curated tastings, which feature a winemaker paired with food from a local chef or catering company, and will host weekly events and specials that give customers the opportunity to sample new wines and blends that are popular during the season. LED BY MASTER SOMMELIER Claudi Tyagi, House of Pure Vin’s top seasonal selections include a sauvignon blanc from WaterFire Cellars that features aromas of tropical fruit, a Black Star Farms merlot cabernet with concentrated dark berry flavors with coffee spice and toasty oak, and a Rove Estate Winery pinot gris that has a fresh, wildflower flavor. For fans of beer and cider, the owners of The Farmer’s Hand recommend checking out their selection of Virtue and Blake’s ciders and craft beers from Michigan-based breweries Atwater, Oddside, and Short’s. Founded in 2016 by friends Rohani Foulkes and Kiki Louya, this Corktown-based shop operates as an artisanal market and café. The Farmer’s Hand sources its food, beverage, and artisan wares from Michigan-based farmers and food companies such as Tantre Farm in Chelsea, Food Field in Detroit, Ernst Farm in Freedom Township, and Hyperion Coffee Co. in Ypsilanti. On Dec. 10, the store will be ringing in the holiday season by participating in Corktowna- Glow, a full day of holiday-themed festivities like caroling, a tree lighting ceremony, and a visit from Santa. Zingerman’s is nationally known for its massive and delicious deli sandwiches, but the Ann Arbor mainstay also has a variety of foods, baked goods, and chocolate and candy that are perfect for the holidays. When it comes to gifts, Rodger Bowser, chef and managing partner of Zingerman’s Deli, suggests The Zingerman’s Bakehouse Cookbook, which features 25 years of recipes. He says the shop also carries a spice kit cookbook, and of course, a variety of gift baskets, which Zingerman’s will actually wrap and ship in or out of state. 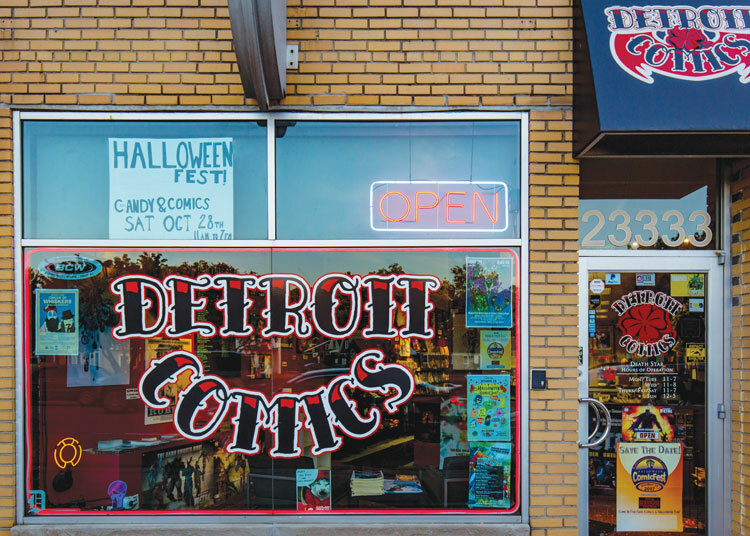 Brian Kelly, the owner of Detroit Comics, is unapologetic about calling his shop an “outpost for the nerdy, geeky world of comic books and graphic novels.” It’s that, for sure, with a huge selection from just about every genre — plus toys and other merch — though it all comes bundled without the pretentiousness you’ll find in many comic book shops. And don’t miss their annual charity event featuring the return of Metalliclaus, the heavy metal Santa, who is reportedly lighting the Ferndale Christmas tree this year. FOR THOSE WHO GIVE a graphic novel, they come bearing a gift with some serious style points. Detroit Comics’ Brian Kelly counts Emil Ferris’ My Favorite Thing is Monsters, Brian K. Vaughan’s Saga, and Black Panther by Ta-Nehisi Coates as titles “everyone should be reading.” Over at Vault of Midnight, Fantasy Sports by Sam Bosma or Kabi Nagata’s My Lesbian Experience with Loneliness top the staff picks list. If you’re more comfortable with a traditional book experience, the folks at Literati recommend Jesmyn Ward’s Sing, Unburied, Sing or the all-ages Where the Animals Go. The simple throwback act of giving someone a book at the holidays hasn’t lost its charm. Better yet, if it’s a title hand-picked from a well-stocked, eclectically curated brick-and-mortar like Literati. 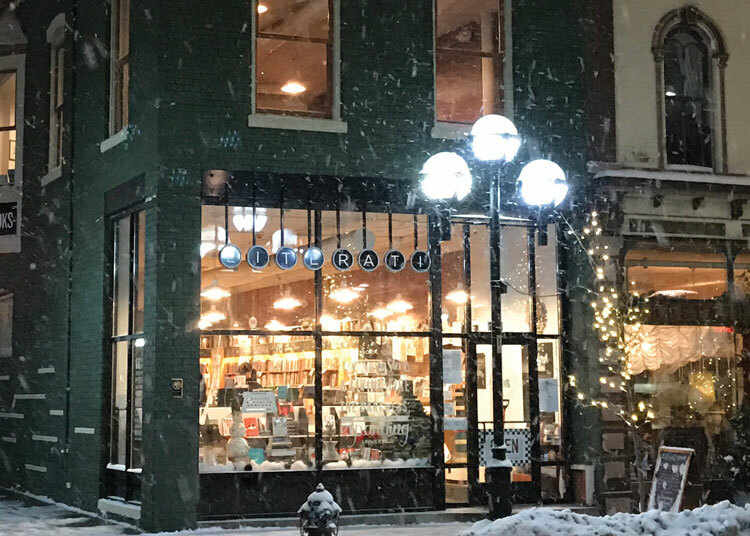 The independent Ann Arbor retailer and coffee shop not only carries extra stock of the most in-demand bestsellers at year’s end, they overstaff to ensure customers get help choosing the perfect book. If a shopper is looking for a favorite reader who is relentless, there’s no better gift than the store’s subscription program, which delivers a new signed first edition every month. Shop for others or shop for yourself. Books and coffee make for a perfect way to spend the morning or afternoon browsing their well-stocked shelves. The Midtown location for this vinyl-centric label, founded by the Detroit native singer/ songwriter/producer Jack White, is the epitome of experiential retail. The space features a record store, event stage, and old-school recording booth. Noel Night shoppers get an extra perk: Third Man’s first Local Indie Record Market lets customers pick through inventories from five Detroit record shops, all while taking in live music and a cash bar stocked with spirits and ciders. Shoppers can even grab a custom T-shirt — screen printed live, in-store — for a one-of-a-kind gift for their one-and-only. Vault of Midnight customers have their pick of either an Ann Arbor or Detroit location, both stocked with vintage comic books, newest graphic novels, games, and kitsch toys. During the holidays, the mood gets extra geeky, with staff donning their favorite ugly sweaters, Mariah Carey’s Christmas album(s) playing on repeat, and homemade cookies for the “most beloved customers.” Don’t hesitate to bug a festively dressed employee for some suggestions. While Detroit Rose does offer a selection of top shelf-worthy face oils, clay masks, and skin polishes, it’s the brand’s candles that really stand out. This December, look out for seasonal scents like Cinnamon Chai, Bourbon Orange Spice, and Mistletoe, as well as more unexpected selections like Tobacco and Bay Leaf, Neroli, and Moss. 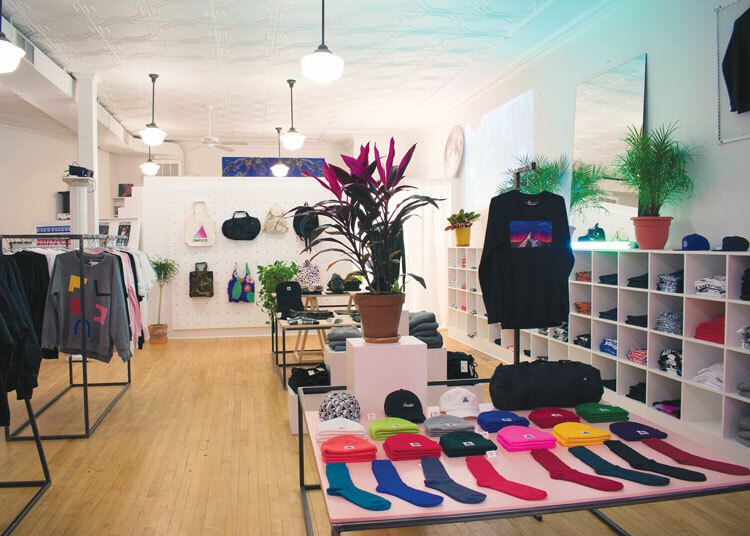 The items are usually only available through the brand’s website, but throughout this winter on the weekends, Detroit Rose is welcoming the public to its fifth-floor Eastern Market studio space to enjoy wine, snacks, and shopping. 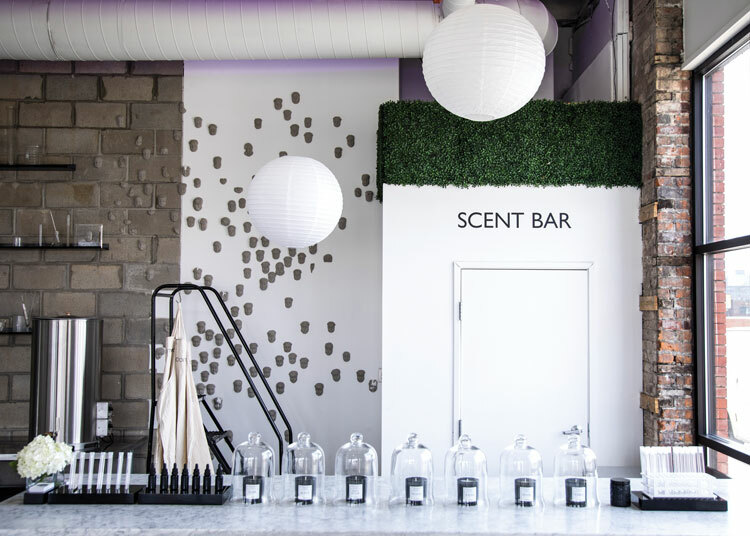 The boutique gallery and showing space known as Detroit Wick gives customers the opportunity to experience the entire olfactory process, says Doug Schwartz, creative director of the company. “We hit all five senses when you walk through the door,” he says. This year, along with offering a limited edition XXL concrete candle and a selection of holiday-specific scents — earth, suede, cocoa, wood, and oud — Detroit Wick will also be displaying work by both local and national artists and hosting scent branding sessions at its minimally designed headquarters in Detroit’s Eastern Market. A special holiday candle set can be privatelabeled for corporate VIP giving. It can also be a perfect last-minute gift to pick up on your way to a holiday party. 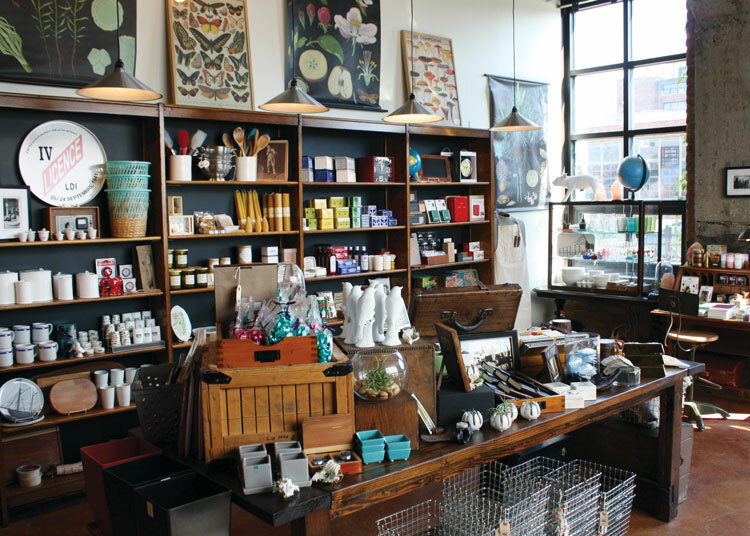 The companion store to its next-door neighbor City Bird, Nest specializes in gifts and provisions for the home, such as candles, terrariums, bar and kitchen accessories, and décor. Some of the shop’s most ideal gifting items this month include wall-mounted and table-top planters from Umbra, vintage-inspired toys, whimsical ornaments, and a selection of bar accessories in silver, gold, and rose gold. The owner of Nest suggests that customers also check out The Roland Pine Candle, which is the shop’s No. 1 selling candle despite only being offered through the holiday season. Special holiday selections include whimsical ornaments that feature “mischievous forest friends” and new lines of barware and bar accessories. The historic pottery company manufactures and sells its products from a 1907 Tudor-style building in Detroit. Like years past, Pewabic Pottery will offer a special selection of seasonal glazes and holiday items, such as the company’s annual Snowflake Ornament trio set — available already gift-wrapped — and a new cross ornament. On Dec. 13, stop by for their Holiday Shopping Night. The Pewabic Store will stay open until 9 p.m. to accommodate shoppers who work during the day, and customers will be treated to food as well as raffle drawings featuring some of the company’s products. 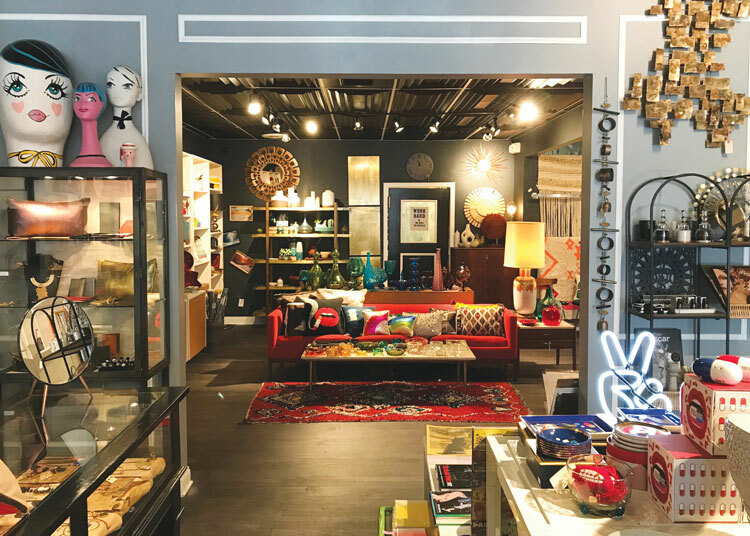 Set in a 1940 U.S. Post office, this new 10,000-square-foot shop features a variety of home products suitable for the interior design fanatic, such as limited-edition prints, picture frames created using reclaimed wood, locally made ceramics, and furniture. From noon to 7 p.m. Dec. 9, Post will host a Holiday Open House where guests will have the chance to go on tours led by the shop’s four in-house designs studios: Leadhead Glass, Scarlet Crane, Mutual Adoration, and Tait Design Co. Demonstrations and refreshments will also be available throughout the event. Shop for small-batch bath and body products, holiday cards made by Michigan artists, and a curated selection of contemporary craft and fine art made by women.